When it comes to “knocking down” larger targets like wild boars, we need stronger and more powerful bullets. For those who have already owned an A​​R-15 or something similar, their choices are narrowed down to the two most popular - 450 Bushmaster vs. 458 Socom. So how do they decide which is the best cartridge for them? Let me show you how these professionals measure up, compare, and choose the best round on the market today. 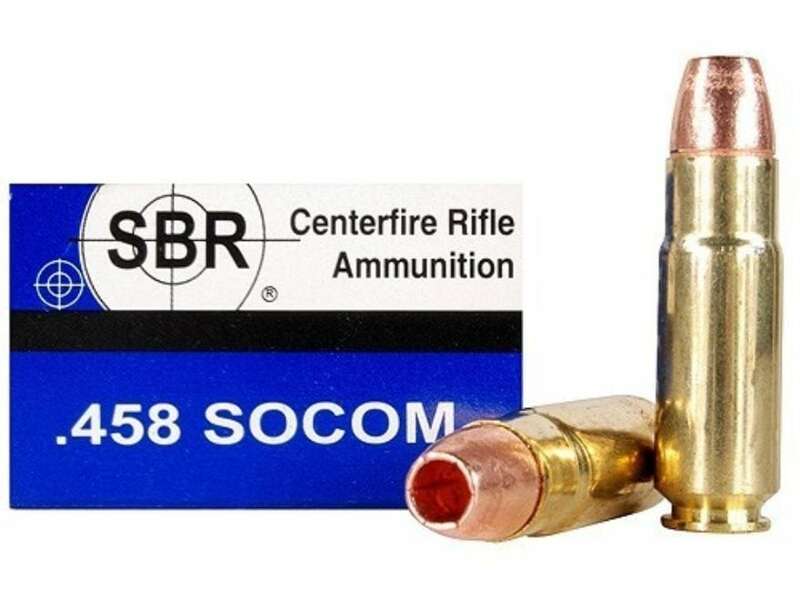 458 Socom works with bullets ranging from 140 to 600 grains. In terms of power range, these numbers are no doubt impressive and incredible, making this round an ideal companion in handling larger games. Velocity is where the 458 starts to show its decrease in performance. The more grains they consume, the more the speed drops. For example, a 140-grain bullet can reach 2.528 frames per second (FPS) while a 280-grain one (double the number) can only handle 1.798 FPS. What does this tell you? 458 Socom comes with a fantastic power strength, but in fact, you will need to stay close to your targets to achieve the best result. If you are keen on taking down big goals, you will have to keep a close range of up to 150 yards from them. Speaking of 450 Bushmaster, it has less power potential but provides a bigger range. This round receives a particular design around 250 grains, so basically, there is a limit to higher numbers than this. Indeed, a 250-grain bullet is no match for 600-grain one of 458 Socom. However, the 450 can offer a velocity of up to 2.200 FPS, even in this size of the grain. Thus, you can take out games that are 220 yards, instead of 150 yards from the 458, away from you. 450 Bushmaster shows off its superiority in range flexibility, making it an excellent choice for hunters. 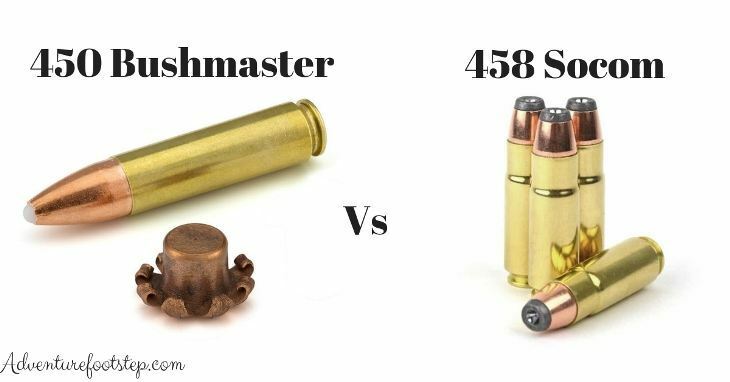 458 Socom can tackle the 600-grain, while 450 Bushmaster can handle half of this number. This comparison only matters depending on which types of games you are focusing on. For instance, if the games are deers, the 450 is more than capable. But a 600-grain 458 cartridge becomes unreasonable with a deer at a close range. All these powers are more suitable with bigger targets, like boars and bears. In this battle, the 450 Bushmaster seems to have more advantages over its rival. Due to its longer range (220 yards), 450 is a perfect choice to hunt down anything at any place. In contrast, the 450 can knock down a bear with a 600-grain bullet but don’t forget; you have to stay closer to your target, which can reveal your position. As common sense, the limitation in tackling larger grains of 450 Bushmaster means you don’t have to deal with much recoil. Thus within a 100-yard range, you will experience less recoil with most builds when using the 450. Both the 458 Socom and the 450 Bushmaster provides special stopping power for ARs, but they have their pros and cons. This article aims at pointing out the primary and most outstanding differences between these two cartridges to make the task of choosing one suitable for you much more comfortable. Choose what is right for you and enjoy hunting down larger games! And I wrote a post about the best AR 10 scope for hunting. let’s read it and chose one for your ar!! !